*Please note that VRBO posts all rates in US dollars. 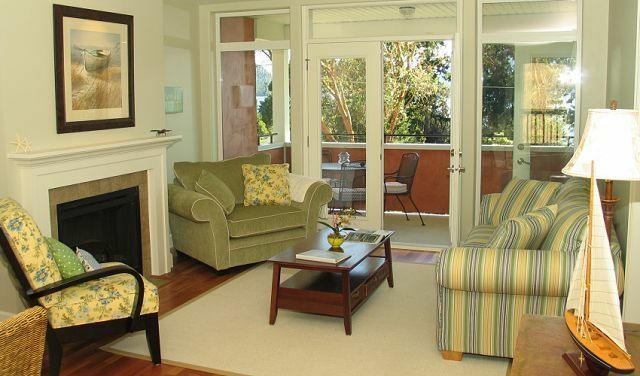 You will enjoy the lovely ocean views from this beautiful top-floor, corner-suite condominium. This exquisitely decorated unit has two bedrooms, two full bathrooms, fully equipped kitchen with breakfast bar, separate dining area, living room with gas fireplace and patio doors that open onto a large deck, washer/dryer, all bedding and towels supplied. This perfect, all-season accommodation provides easy access to boating, water sports, two golf courses, arts, culture, winery tours, beachcombing, and the world-famous Saturday Market. A five-minute walk to Salt Springs warmest swimming beach, a quaint village store, oceanside restaurant and government wharf. Located in the very desirable neighborhood of Vesuvius Bay. Salt Spring Island is the jewel of the Southern Gulf Islands. Come and experience the magic. PLEASE NOTE VRBO IS NOW DISPLAYING ALL RATES IN USD $ : "Get an Instant Quote" tab will default & display in USD $. We are Canadian based so we do charge in CAD $. Please go to "Rates" tab and select CAN$ (top right of table) to view the actual CAN $ rate. Please be advised that I do not list this property on Craigslist. Both are full bathrooms. To engage shower, please pull down on the metal ring at the base of the bathtub faucet.